​​The community of Los Angeles became involved with the Civil Rights Movement in 1956 when Dr. Martin Luther King Jr. and Rev. Ralph David Abernathy traveled to L.A. during the Montgomery Bus Boycott. The Civil Rights Exhibition premiering at the Museum of Social Justice will introduce you to many of the dedicated artists, women and men who fought for Freedom, Justice and Equality in America. 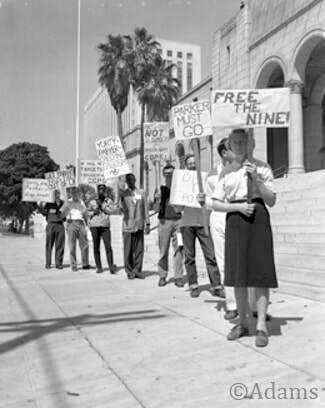 Most people are unaware of the important and critical role that Los Angeles citizens played in the struggle. Finally, audiences will be able to see the faces of the Los Angeles heroes from the entertainment, religious, political, and educational communities that placed their lives and careers on the line for the rights of African Americans. Their collective efforts contributed to the success of the American Civil Rights Movement. This exhibition has crossed color lines and reflected the great people of Los Angeles who participated in the March on Washington, lobbied for the Civil Rights Bill, the Voting Rights Act, the Public Accommodations Act and helped to create social justice in America. The Civil Rights Movement was born out of the frustration of 244 years of African American Slavery from 1619, 100 years of Jim Crow Segregation and recently from the cries of injustice in Ferguson, New York, Cleveland and Charleston. This exhibit is designed to inspire dialogue and peaceful solutions for social injustices anywhere they may exist. Photographs courtesy of the Tom & Ethel Bradley Center and the family of Harry Adams. Photograph by Charles Williams. July 9, 1960. Dr. Martin Luther King Jr. and Rev. Maurice Dawkins peacefully picket outside a Woolworth store. Rev. 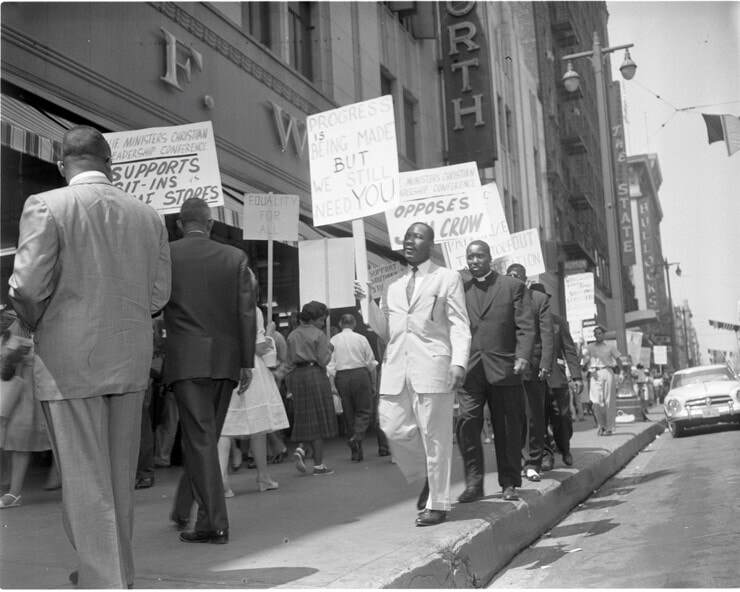 Maurice Dawkins, chairman of the California Christian Leadership Conference, and the participants marched in support of the Student Nonviolent Coordinating Committee (SNCC) and the Southern Christian Leadership Conference (SCLC). SNCC and SCLC spearheaded the national “sit-in” movement at dime store lunch counters. Photograph by Charles Williams. July 10, 1962. 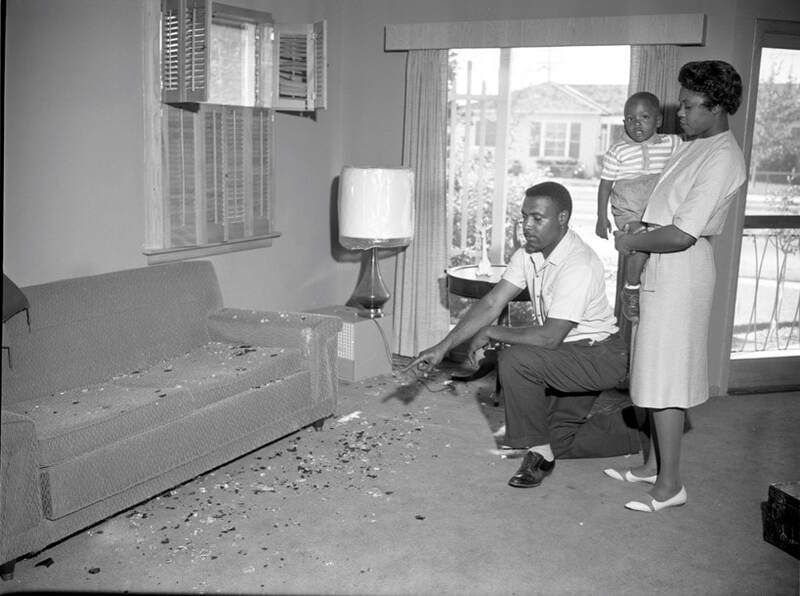 Thomas Wells, his wife Eleanor, and nephew Raymond Conley showing broken glass from a shotgun fired into their home by white neighbors. The shotgun blast occurred after the neighbors threw beer bottles into the home. According to the Los Angeles Sentinel newspaper, “Wells held his ground. He borrowed a neighbor’s shotgun and held the suspects in check until police arrived.” Several men were arrested for firing into the home following a wild party. Hon. Loren Miller. As an attorney, Loren Miller shepherded the case against Racial Restrictive Covenants on homes in Los Angeles through the federal court system to the Supreme Court where he and Thurgood Marshall successfully argued the case. 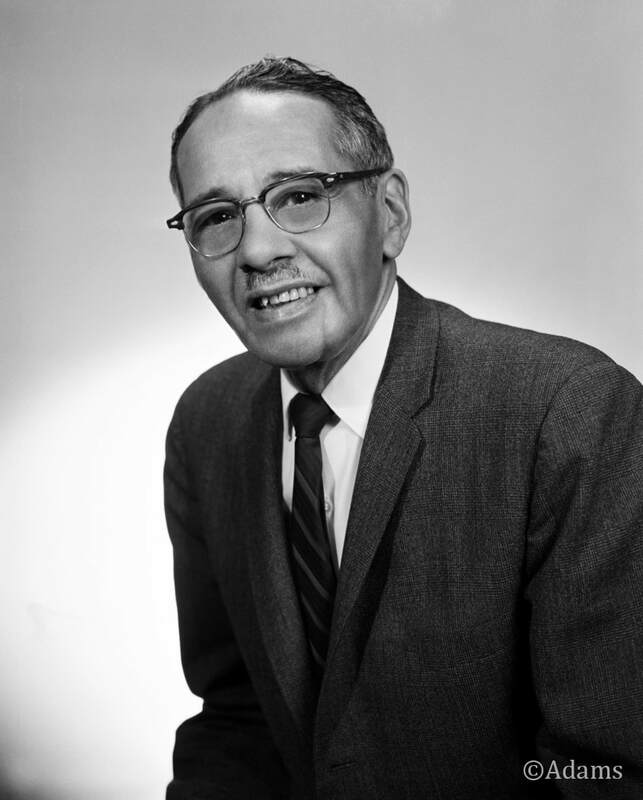 He also worked with Marshall on Brown v. The Board of Education, Topeka. Miller was also a columnist and eventual owner/publisher of the California Eagle. Gov. Edmund Brown appointed him to the California Superior Court. 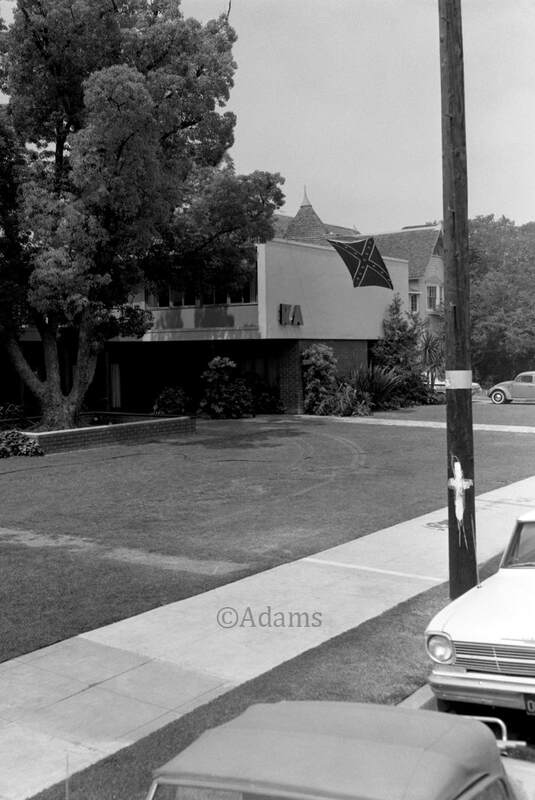 A Confederate flag hangs on the Kappa Alpha house at USC. Founded in 1865, at Washington College in Lexington, Virginia. The Kappa Alpha Order listed Confederate General Robert E. Lee as an inspiration. He was designated the "Spiritual Founder" of the Order by John Temple Graves at the 1923 Convention. Los Angeles 1965. Photograph by Guy Crowder. 1969. 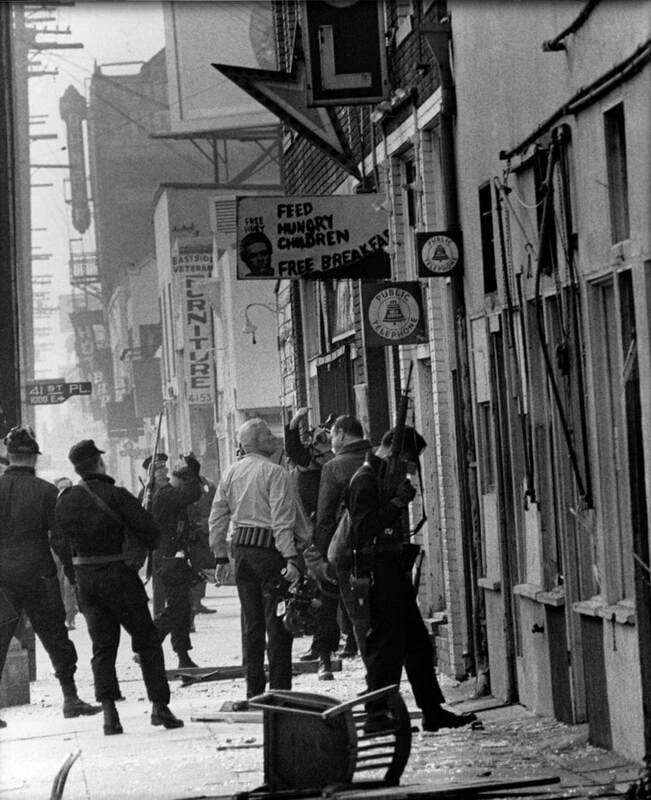 Members of the Special Weapons and Tactics (SWAT) unit on Central Ave. following their pre-dawn raid on the Black Panther Party Headquarters on 41st and Central Ave.
LAPD’s first use of S.W.A.T. resulted in a full-scale battle in the neighborhood when members of the Black Panther Party resisted the search of their headquarters for illegal weapons. The shootout lasted over three hours and over 5,000 rounds of ammunition had been exchanged. Amazingly no one was killed.